Jonathan Sandys and Wallace Henley, God & Churchill. Tyndale House, 2015, 268 pages, $18.38, Kindle $9.45. This book does not aim to be a thorough study of Churchill’s thoughts on religion. Both the authors and contributors, which include statesman James Baker and columnist Cal Thomas, openly acknowledge that Churchill was not “a deeply religious man” (xvii) or a “pious religious devotee” (91). For a more rounded picture, readers need to supplement their reading with other sources, including Churchill’s own writings. Readers who know Churchill’s writings well will miss the nourishing richness and complexity of entire texts as the authors mine them for shorter, though accurately reproduced excerpts to serve their larger purpose: to understand how God worked through Churchill’s life, and to highlight important characteristics which enabled the statesman to fulfill his destiny. Even short quotations glimmer on the page and are a pleasure to encounter. When presenting biographical material, they interweave lessons or text from the Bible into well-written summaries of some of the most famous episodes of Churchill’s early life through World War II, seeking to reinforce a sense of the miraculous in his several brushes with death and other seeming coincidences. They encourage that the reader view events as guided by the “unseen hand” of God (57)—which Churchill himself speculated might have influenced some of his narrow escapes. Contrasting with English religious beliefs and traditions, the book discusses Hitler’s spirituality (or lack thereof), and spiritual failings of Nazism including its embrace of scientism and utilitarianism (133-52; this discussion would be richer if it drew on a wider range of sources); and the corruption of German churches during the Third Reich (153-64). World War II emerges as a critical battle for the preservation of “Christian civilization” and Churchill as its unlikely, though predestined, leader to victory. The narrative often takes on the tone of a Bible study. For example, in one instance of exploring the language of biblical text, the authors write: “we understand what righteousness may have meant to Churchill when we see it in the original language of the New Testament” (96; italics are in the original text). This is followed by an excerpt from a 1933 Churchill speech which is not overtly religious but speaks to the ethical conduct in a democratic society. Situating political speeches in the context of Biblical study is not always a perfect fit, but can stimulate worthwhile thought in many contexts. Throughout the final sections, including “The Core Principles of Christian Civilization” (118) and “Beyond the Beatitudes” (100), the authors follow profound and thoughtful quotations of Churchill with musings and arguments entirely their own. In the final pages, they seek to explore “The Underpinnings of Churchill’s Composure” (196) in a chapter evaluating “How Churchill Kept Calm and Carried On” (191) during World War II. Here they repeat that Churchill was “a man of faith” despite “not being an overtly religious man” who “believed in God’s ultimate providential care−for himself and his nation” (196), and segue into a chapter on “Churchill and the Character of Leadership” (211) where they praise his sense of destiny, courage, and perseverance as a model to which we should all seek to aspire. The final chapter seeks to provide “help and hope for our times,” by repeating the authors’ belief that “Churchill’s life is an example of how God dynamically engages with human events by intervening at critical junctures to guide the course of history” (229) and emphasizing the importance of Churchill as “a willing and available leader with an intuitive sense of divine destiny” (236; italics in original text). Erica L. Chenoweth is a frequent reviewer of books on Churchill and co-edited a new edition of Great Contemporaries (ISI Books, 2012) with James W. Muller and Paul H. Courtenay. She has served as a research assistant for several forthcoming editions of Churchill’s works. 1 Winston S. Churchill, Thoughts and Adventures, ed. James W. Muller with Paul H. Courtenay and Alana L. Barton (Wilmington, Del. : ISI Books, 2009), 359 (hereinafter T&A). 4 Ibid, p. 270, 273. 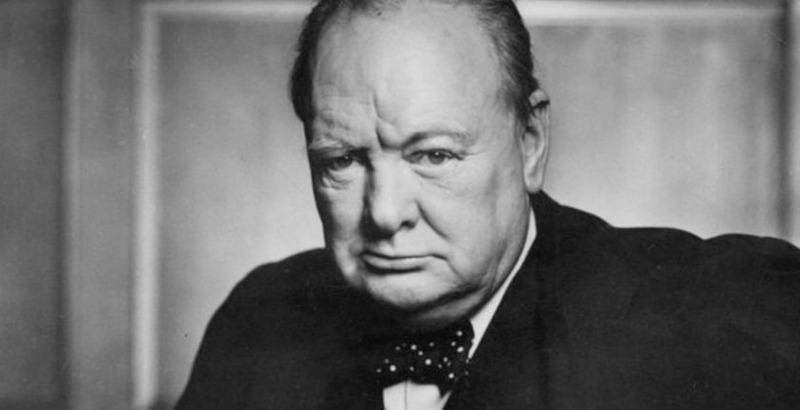 5 “Using God and Churchill in your Ministry,” authors’ website, http://bit.ly/1S3d7bC. Accessed March 20, 2016. 7 Winston S. Churchill, The Second World War, Volume 1 The Gathering Storm (London: Cassell, 1948), 250, as cited in Patrick J.C. Powers, “Savrola and the Nobility of Politics: Winston S. Churchill’s Premier Literary Work” Finest Hour 74 (1992): 7. 8 “Washington’s Farewell Address 1796.” The Avalon Project: Documents in Law, History and Diplomacy, of the Yale Law School. (New Haven, Conn.: Lillian Goldman Law Library, 2008) http://bit.ly/1Pnj696. Accessed 20 March 2016.